Yeshá Ministries was founded on June 13th, 1983 at Neptune Baptist Church by Charles W. Coker. Dr. Coker is a 9th Degree Grandmaster who holds Taekwondo Dan grade certifications from the Korean Ji Do Kwan Association, USA Taekwondo Association, World Ko Am Mu Do Federation and Kukkiwon. He began his martial arts training in 1967 under Senior Master Bill Beach. In addition to Taekwondo, Grandmaster Coker also holds Dan grade rankings by the World Hapkido Federation, American JuJitsu Federation and Ving Tsun Kung Fu. He competed while in the United States Marines during his active duty days (1968 until 1975.) He continued competing until 1983 when he retired ranked 2nd (in his division) internationally by Black Belt Magazine. Since his retirement and closing their commercial schools, he and his brother Grandmaster James R. Coker, focused their attention on using Olympic Taekwondo as a tool for ministry as well as personal development for those not be able to afford Olympic training. Yeshá is designed to be an outreach of the local church and serve as a community development organization with Christ at the center of the program. Dr. Coker is the CEO of LifeThrive Performance Systems, Inc which is an Organizational Development Company specializing in the use of Human Data to improve performance and productivity. He has offices in both the US and Europe. He has been married to Tracy for 32 years and is the father of 9 children, three of which are also Olympic certified Black Belts. Kevin Thomas is 6th Dan Black Belt Master Instructor and a member of the Board of Directors with Yeshá Ministries. He manages the testing, special events and public relations as well as the editor of the quarterly newsletter. Kevin joined Yeshá Ministries in 2004 as a 1st Dan, following years of studying Taekwondo. Kevin started his martial arts career in college after wrestling for six years. He’s participated on the Yeshá Ministries Demonstration and Competition Teams. He won gold, silver and bronze medals for sparring and forms at the 2011 and 2014 AAU National Championships. Prior to joining Yeshá, Kevin was certified in Krav Mega. He enjoys sharing his knowledge and experiences with others so they may grow in this sport and life and faith. Kevin works as the Director of Retirement Benefit Services for FIS. He and his wife enjoy traveling, outdoor activities, cars and motorcycles. He also serves the community as a Team Leader at his church, an Assistant Chair for The Players Championship, Director of Field of Dreams Baseball for special needs children and Board Member for the Pop Warner Junior Jaguar Bowl. 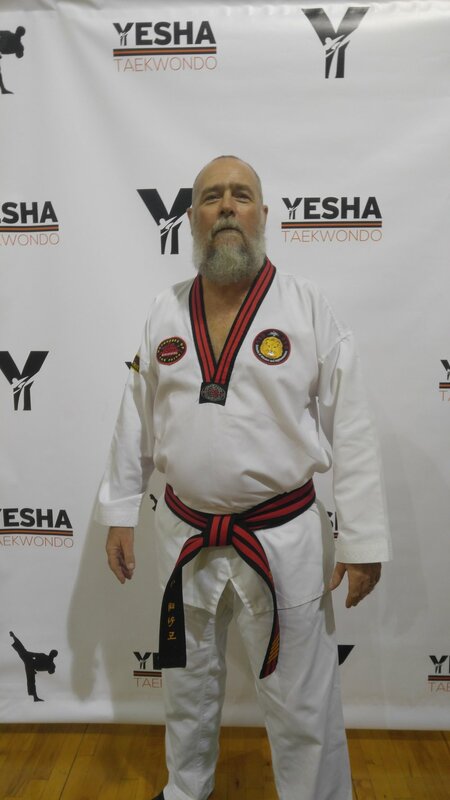 Ron Jenkins is a 5th Dan Master Instructor with Yeshá Ministries. Ron began his martial arts training in 1974, had he has a black belt in Judo an id s St. Kyu in Shito Ryu, Karate. After Karate, Ron began his training in Taekwondo, and continued off and on (due to school closings) for more years than he can remember. Ron opened his first school in Greenville, South Carolina in 2011. Ron's best friend and fellow Brother in Christ is Grand Master Coker. They have been friends for over 52 years! Ron is retired and enjoys... well almost everything! Ron and his wife Manette enjoy traveling, target shooting and hanging around their "children" (3 Labs and a Huskie). Mark Sadusky is 5th Dan Black Belt Master Instructor. He is currently responsible for overseeing two of our Yeshá schools and is an active member of the Master's meetings that assist and guide our instructors and students. Master Sadusky joined Yeshá Ministires after watching his youngest daughter test for her yellow belt. They both went on to receive their Black Belts in 2001. He competed in the NE Florida Sport Karate Tournament in 2001 taking 2nd in sparring, however his true love is for breaking. After receiving his 4th Dan Black Belt he traveled to all of the Yeshá schools teaching breaking and was instrumental in writing the required breaks in the Student manual. Master Sadusky was a 6x undefeated Yeshá Breaking Champion and in 2002 at the ISKA US Open World Championship, he placed 5th in the World for Power Breaking. Master Sadusky is a motorcycle enthusiast, enjoys photography, bungee jumping, sky diving and scuba diving. He enjoys his family life and feels blessed in all the opportunities that he has been afforded. Master Olipendo is the Lead Instructor for Mandarin East. Master Ritchie is over the Fruit Cove school on Race Track Rd. He works at Harte Hanks as a desktop computer technician and has been since February 2012. Prior to working at Harte Hanks he worked at AT&T U -Verse and was a commercial insurance agent for 20 years. Steve has served 4 years in the US Air Force from 1977 to 1981 and went to high school in Michigan, Middle School in Chicago, IL, and Elementary school in Ohio. Steve has been involved in Yeshá Ministries for over 15 years as an instructor at Fruit Cove Baptist church. He teaches Taekwondo as a way of sharing the gospel to people in the community.